Used primarily for caulking teak boat decks, Teak Decking caulk is a thixotropic material that does not sag during cure, and has excellent temperature stability and chemical resistance once fully cured. Because the sealant is neutral cure, it is non-corrosive to all substrates. Available in black, white, and gray. Looking to bring some caulk during some extended cruising to fix teak seams as needed... Is there any product expiration date? Thanks. None listed, but there is a manufacturing date. I bought mine 2 years ago.Last time I used it this past fall without issue. Keep away from heat orcold and you should be fine would be my guess. Yes there is an expiration date, but if you dont open the cartridge it will last a long time. Opened up cartridges are getting hard 3_6 months. It is an excellent product, we redid all the teak seams with it. Easy to clean up as well but you need to tape off everything around the seams. Recommended. I would cat TDS as I have in the past. They would be best to comment on their product. It only hardens up when it is exposed to air. I have used this over several days and keep the tube closed when not in use with a long screw. Sikaflex 295UV would have better adhesive qualities. I need to re-caulk my deck, the weather right now is over 100 degrees, should I wait until cooler weather maybe this fall or can I apply the caulk during evening hours and let it cure over night? During the day I still expect it to be somewhere between 90 and 100 degrees. Hi I have recalled the teak decks on 2 yachts in summer in Georgia using this product. It went off too quick in the middle of the day so that time was used for preparation. ..it was in the 70's and early 80's so 100 degrees F will definitely be too hot. Early morning and late evening is best but you need a large fan pointing at you to keep the no-see-ums at bay! Great product. Have installed it in 90 to 100 degree summer heat. Flows nice and sets up just fine. Need to work fast or it glazes over quickly. Have had some installed for 5 years and it is holding up well. I would wait until the temperature of the deck is below 90 deg F. The product label says temperature needs to be between 40 and 90 deg F. If the deck temperature is above 90, especially in the tropics, it may cause the caulk to bubble out of the seam as you lay it down. seams need to be clean and dry. after i caulk the seam i run my finger down the seam, use latex gloves. after the caulk cures a bit i run a putty knife down the seami like to tape both sides of the seams, makes clean up easier. I have a Grand Banks 46 classic .How much product will I require to complete this project? Without more info impossible to answer your question. I did a Hudson 50 sailboat and used a lot, probably around 25 tubes. After two years of work and still more leaks than when I started I got rid of the teak. I tore up about $40,000 worth of tesk and put down a nice fiberglass deck. Painted it, striped it and No leaks!!! Looks great. I now have a functional boat where I can spend time cruising rather than working on teak decking.Hudson 50 Seute Deern Sailboat & crew. This is a great product ! Obviously, you'll need several tubes, BUT, consider buying 1 tube, time the project's consumption of that tube, and then order a number of Teakdecking caulks to complete the next phase of work. It is time that limits your purchase. Some people will restore the deck in sections over a long period, BUT the Teakdecking caulk does not have a long shelf life. Open a tube, use it within two or three days. I have heard reports of Unopened tubes being wrapped in aluminum foil, refrigerated, or kept in a cool, dark space in order to extend shelf life. Knowing your work schedule will allow you to order fresh tubes and not be caught with a hardened un-opened caulk that has been sitting around neglected for a few months. This is the only teak deck caulk I use. It is great stuff! Will this adhere to itself if doing spot repairs? Yes, just make sure to prep surrounding areas. Yes, I believe it will. Provided that the original caulk is still in good condition that should be no problem. Yes indeed, but its best if you slice away a bit of the original so that there is a fresh clean surface for bonding with the new TDS caulk. I use this technique when repairing caulk 'tear outs' and separations from thinned out teak deck strakes. We had our deck done with this product 3 years ago, now in the high heat sun 100+ out, the seams are soft and tar like. tracks on your shoes, what is going on, the decks are cleaned with salt or fresh water only? We've had no such problem. We're at altitude of 6500 feet. Average temp. is 70 - 80 degrees in summer 60 at night. 10% humidity. Teak decking is sealed with Semco. I am sorry I cannot. I am just redoing my deck now and have been happy with it thus far. I am in the San Francisco Bay Area so I don't see those kinds of temperatures. I have spoken with many people that are happy with it. If that is the case it raises real concerns since I am headed for the tropics. If you find an answer I'd be interested. I don't know the answer. I had orignally redone my seams with the 2 part boat life caulk. I used this to do some touch ups only due to the reviews. I have a boat on fresh water. I coat with only a teak sealer -- but I have read that some of the materials used to coat the teak may react with the caulk and soften it. Are you using any coating materials on the caulk? I had problem with Sikkens, went to a different material; just to seal; but need to put on couple times a year. OK... so i see this is for teak decking... however, i have mahogany on the exterior of the bridge, and Cap rails on my 46' 1965 Chris Craft Constellation.. which will receive stain and varnish.....would this be a better product to use on the seams rather than the boat-life product for this application..?? TDS caulking is compounded to be sandable a few days after application. If you are sanding seams to get them nice and flush then TDS would be the way to go. I use it for gluing in polycarbonate windows to grp frames and polycarbonate renewal in aluminum hatch frames with good results. I still use 5200 or boatlife for deck fittings and of course silicone for plastic deck fittings. TDS works well for glueing down woods as well as caulking seams. 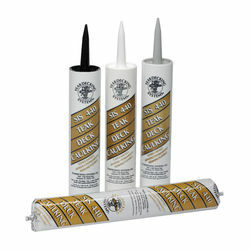 This is a great product, as it does not require a primer in the caulk joint. My concern would be the sequence you plan to install it. If you apply after varnish is there a bonding issue to any varnish that gets into the joint? or if applied prior to finish, what is the effect of the varnish that will come in contact with the sealant? This would be a concern no matter what product was being used. I would contact the Manufacture direct for some tech assistance on this one. Good luck. I have a similar situation. I have a 37' wooden ketch with yellow cedar planking.I redid the seams last November, traditional cotton with the teak decking material on top. The hull is bright finished with Cetol Marine over the caulking. The boat has been in the water since, and I have not seen anything untoward happening. I do wonder about the Cetols retention over the teak for the long term, but so far it is working. I also did the deck, which is fir, and the cetol does come away in some of the heavy use areas such as in front of the companionway. I will post some results as time goes by. The boat is located in the west coast of BC so is exposed to the weather all winter. Great Stuff. Used to do deck on my 50' sailboat. Very easy to work with. Teak has to be sanded and clean to get good adhesion. I didn't used anything other than teak oil to do deck after sealing. Lasts about 2 years max. I don't think any enamal will stick to the rubber surface. If you paint it I think you will end up with a mess!!! I have never tried to paint the caulk with enamel. I used the caulk with teak wood only without paint. Rest assured the caulk is really a good quality product. It doesn't get soft over time. Teak decking system caulk has been a great product to use over the last 7 years. I have only used it to rework seams in my teak decks which have held up well when applied correctly. Not sure you can paint over it but it does adhere well to the oily teak deck and seems to stand up well to temperature changes, -10 in Rhode Island winter to 110+ California Delta summers. I always keep a few tubes around to touch up my 30 year old teak deck. The product shelf life seems to be greater than stated. My gut tells me it may not be the best idea. To putty hull seams you should use a compound that is formulated for that purpose. This stuff is for teak deck seams. Also, I'm not sure this product will hold paint very well but you may want to contact the manufacturer about that. Plus there are less expensive compounds. No matter what you do, always prime the seams before you putty. Don't know. Only used on tradition teak deck seams over fiberglass. Call TDS they are very helpful. Can this be used with Star Brite Tropical Teak oil? Also do you recommend taping the teak before applying the caulk? Over spill can be sanded off correct? Teak oil is not advised. Just attracts dirt. Don't use it. Absolutely yes to taping before caulking. If you don't you will have a huge mess. After it's dry(48 hours) you can sand it evenly. Yes, be sure to remove tape when caulk is still very pliable. Hi Tabbetha, I can't answer your question about Star Brite having never used it. I recommend masking the teak to minimize the black dust when sanding, just be sure to remove the tape before the caulking has dried completely or you may pull the caulk out of the grooves. Also you should put pin striping tape on the bottom of the groove so the caulk sticks to the sides and not the bottom causing it to separate from the sides during shrinkage. Hope this helps and good luck. I was recommended this product after having a bad result with a competing brand. This one works really well. This comment is for the guy that thinks because they caulked hundreds of hotel rooms they know everything about caulking. Get a five gallon bucket, fill it with hot water, and drop the tubes to be applied into the water for 10 mins. The warmer the material the better it flows! We caulked our deck with Teakdecking systems, it went on smooth and easy after a lot of prep work. The finished job looks great! TDS Caulking, No more needs to be said! As far as I'm concerned, TeakDecking Systems is the best deck caulking on the market today. The caring staff at TDS is rare these days. All others are trying to catch up! Easy to use, works as advertised. I definitely would use it again. Used it to do something unique in a bedroom. Appears very compatible with oak. Easy to use. Was lazy and used high speed grinder to remove excess caulk. Held together extremely well. I use this calk on my CT-41'sTeak decks and my three hatches, works great! I like this product, works as advertized. A little product leaks by the tube piston, solved the problem with a sandwich/snack bag over the caulking gun piston, otherwise product gets on the caulking gun feed mechanism. This is what was recommended on forums for my teak deck and I'm not disappointed. JD has the best price I've found.